Notice any pattern? From The Economist. PayScale data. - Surprising to see that science looks comparable to humanities (and much lower than engineering etc.). Is this reflective of an academic/industry difference? Any other ideas? - Where are all the highly selective (say less than ~17% admission rate) non-engineering etc. data points? - How much of the difference is due to the type of student who pursues each major rather than the value added of the education? (I'm assuming admission rate is a decent proxy for average student ability). It would be interesting to slice this data by average SAT M/V per college+major as well. but I don't see anywhere to get the raw data to recreate the chart above (I would like a version which allowed looking at the raw data for each point). The big omission is admission rates. If they were present it would be possible to scrape the data from the pages. The methodology page is worth a look. The data appears to be for students who only have a bachelor's degree. They calculate separate ROIs for in/out of state for public universities. If anyone knows where to get raw data that would allow recreating the chart above please post. Comparing the (e.g. 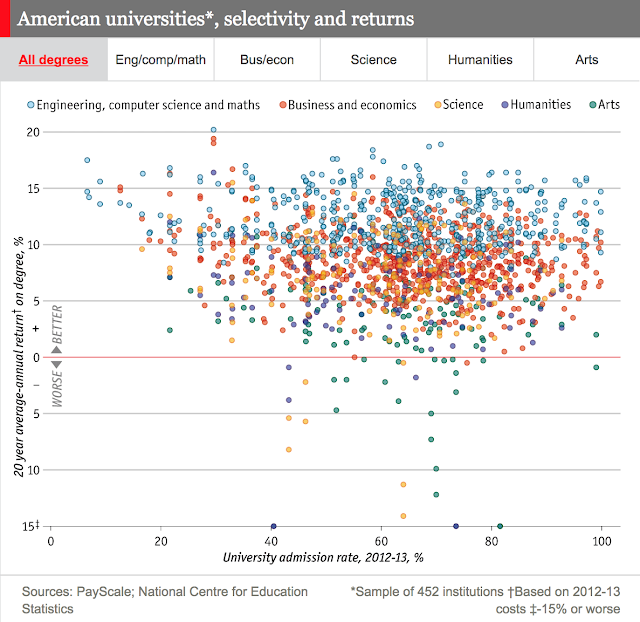 computer science) majors by annual ROI (%, as in the chart) and 20 year net ROI ($) gives dramatically different rankings (and including financial aid also makes a substantial difference). For example, the >20% ROI data point appears to be in-state UVA engineering majors with financial aid included (implying with financial aid is the data set used in the chart). I suspect the relatively flat regression lines are explained by an increase in cost with selectivity. In other words, I suspect a chart of the 20 year net ROI instead of the annual % would show more variation by selectivity. On average, costs rise with selectivity. So constant ROI as selectivity approaches its maximum (elite privates) suggests that incomes are also rising with selectivity. I also don't understand why there is no data for highly selective non-quant majors. "Science"is a mixed bag, ranging from phys and chem (small fraction of total majors), to biology and other life sciences that are not (on average) well remunerated. In other words, zero correlation. But as Dr. Hsu notes below, costs increase with selectivity, so the implication is that ROI declines with selectivity. People are trading wealth for prestige. If a student who attended an expensive, highly selective college gets the same ROI as someone who attended an inexpensive, not-so-selective school, then the former must have earned more money during the ensuing 20 years. (ROI is computed on the money spent on higher education.) However, whether this has anything to do with the school itself, as opposed to the higher ability level of its students, is not clear from this data. PS I would rather have the data displayed with SAT score as horizontal axis. I suspect we would see stronger correlations. 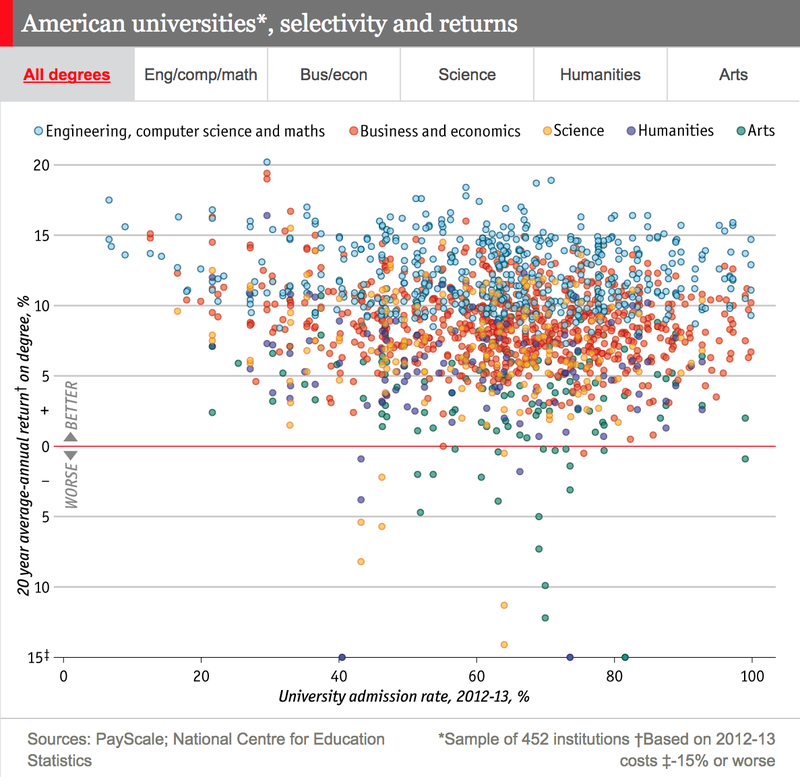 All engineering programs are selective, regardless of the overall admit rate of the university. Just being able to do the work and graduate is a pretty decent filter. I agree. The issue I see is relatively non-selective schools that rely on the difficulty of the engineering program as a filter might have low university-wide average SAT scores (i.e. you need per department SAT scores for them to be meaningful, are these widely available?). Is there any research out there that attempts to evaluate the ROI of different forms of education while accounting for student ability? I'd especially like to see the results across a broad spectrum of educational alternatives. Say all the way from no HS diploma to PhD including alternatives like vo-tech and trade schools. I find the current approach in the US of:trying to increase college admission percentage while simultaneously turning college into the "new high school" (e.g. lower level college classes for things covered by any decent HS program, like basic algebra) absurd and worry that it renders meaningless any attempt to compare current educational outcomes with those from decades ago (especially if one fails to account for student ability). I wonder how much correlation we would see with an attempt to fit average ROI (from above) by major to average SAT by major (not per college, just an estimate using any available data). It's a good post, though I thought you might have chosen to write about the adjacent article in this week's issue of The Economist called "New York’s best schools: Asians beware". It hits on a theme you've blogged about before: whether it is "good" or not to discriminate against Asians at elite schools. De Blasio seems to think it's a good idea. The current NYC schools issue seems like a good test case. I'd be interested in Steve's take on that as well. Some more background at http://insideschools.org/blog/item/1000751-with-new-mayor-could-shsat-be-history? which links to a 20 page report recommending change. Also, when speaking of "ability", one should be careful to define it properly. You would find it surprising to learn of the skills that result in higher returns in the corporate world. Even within technical fields, after a certain minimum threshold has been crossed, it is more often than not the case that social/political/schmoozing/bullsh*tting skills that result in moving up the hierarchy (and hence income). Interestingly enough, in my experience, Ivy League types have these skills in abundance (excluding perhaps some of the more technical places like MIT, with which I have no experience). I think the experience of having gone to something so selective gives people some confidence. The problem with this analysis is that acceptance rate is a very poor proxy for prestige, quality, or even (global) selectivity because of the self-selection of applicants. Most people won't apply to a college they have no hope of getting in to or have absolutely no desire to go to. The means acceptance rates aren't as low for highly selective schools or as high for indiscriminate schools as you would expect. There are also tons of exogenous factors that screw up the comparison even more. As an example, for a long time Harvard had about half the acceptance rate as Yale did but the stats for the student bodies didn't differ by that much (e.g. for the class on 2000, Harvard's admit rate was 10.9% and Yale's was 18.8% -- the difference grows as you go farther back). Why is this? Because Harvard's brand is sufficiently strong that lots of people without any hope of getting in will apply. Yale's brand wasn't that strong, but the gap appears to have closed now. If you want to get a better sense of the madness of acceptance rates, look at this list: http://colleges.usnews.rankingsandreviews.com/best-colleges/rankings/lowest-acceptance-rate. Even on the first page -- where acceptance rates are below 20% -- there are a bunch of schools that you wouldn't and shouldn't expect. That said, there's a notable upward trend in the technical majors for schools with acceptance rate <20%. I'd guess that this is because most schools with acceptance rates that low are elite, so that may be the "true" trendline here. But there's still a lot of noice. Rather confused by the science issue. Biology is the entry way to medical degrees and biology majors dominate science majors at US institutions (also psych to an extent). So you might have 200 bio majors, 100 psych, 40 chemistry and 5 physics majors in a class. Obviously large #s of bio majors do not make it to med school, but still the average income of those who do is very high. If only 5 or 10% of bio majors become doctors/dentists, the effect on average income is not that significant.